The Moosey Calendars started in the year 2006 as personal Christmas gifts for my family and friends. From little acorns mighty oaks do grow! Now my calendars are free for all to download, print, share, and enjoy. Dog followers will be pleased to know that I now produce a strictly dogs only calendar each year - well, actually it's just one dog, Rusty, twelve different poses... The cats, of course, have their own calendar. I hope you'll enjoy choosing your calendar. Hopefully you'll see some of your favourite Moosey images. All my Moosey Calendars are in PDF format, and can be downloaded and printed for no charge. And most of all - please enjoy every moment of each month! Flowers take the prettiest pictures! Here is my 2018 Moosey Flowers Calendar, colourful and bright, free for you to download. Colourful flowers are a joy in a garden, and shrubs that work hard all year round can be so colourful when in bloom. My 2018 Moosey Flowering Shrubs Calendar features many of my favourites - particularly rhododendrons, which I adore. The 2016 calendars feature the Moosey Garden at its most colourful. Serious winter pictures have been banned, and autumn only gets a few chances to show off its tawny shades. Roses, flowers, herbs, shrubs, and beautifully green lawns abound. It's free to download. Here are my archive 2016 cat and dog calendars. One year they might line up the days and dates again. It's not so easy recycling old calendars! I've always loved sharing my garden with others, and I've always made personal calendars for my friends and family. 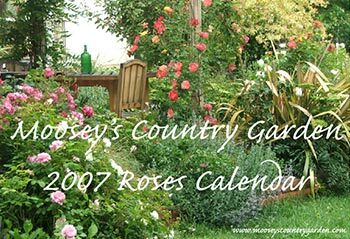 It's a pity that old calendars aren't as easily recycled as old roses are! Printed calendars end up in the rubbish when they're out of date. What to do with the old Moosey ones? In 2014 I collected the very best cat and dog pictures from older calendars and put them together. My Best of the Cats and Dog Calendars are sadly out of date now, but I don't want to throw the out. The Moosey cats and the dog have always been superbly photogenic! Enjoy! This archive page contains my original 2012 calendars. The Moosey Garden is in the Southern Hemisphere, where mid-summer comes at Christmas time. So the calendars have always had a good excuse to get their seasonal images upside down. In 2010 I again made some calendars for family and friends - for Christmas presents. After a few disasters (days of the week not fitting with dates, November getting 31 days instead of 30) I got it right. One featured the garden, the other featured the Moosey cats. This archive page gives me a place to store the old Moosey garden calendars from 2009. Some of the older photographs are just beautiful, and the same days and dates combinations will return some year. Soon these old calendars will be able to be recycled. Yippee!